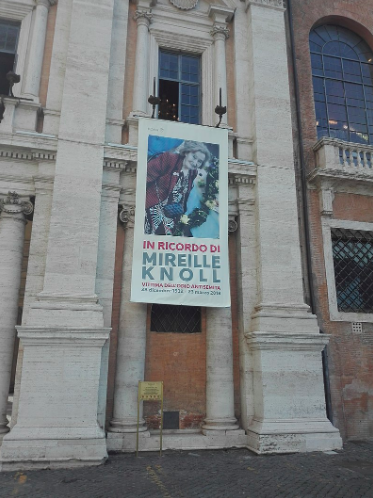 A banner in Rome commemorates the life of Mireille Knoll, a Holocaust survivor who was murdered in her apartment in Paris last year. Jove. CC0. In October of last year, a gunman in the US city of Pittsburgh opened fire at a synagogue, murdering eleven people and wounding six before being apprehended by police. On New Year’s Eve, a Berkeley resident was charged with leaving a fake bomb on the campus of the University of California that was covered in “anti-Jewish writings”. The man was charged with dropping off a fake explosive but was not charged with a hate crime. With the recent rash of violent outbreaks in American cities and xenophobic rhetoric coming from the White House, it is easy to think that hatred and bigotry are exclusively American traits. However, one of the darkest chapters in anti-Semitism occurred in Europe in the 1940s, when around six million Jews, roughly two-thirds of the Jewish population in Europe at the time, were murdered by Adolf Hitler’s Nazi regime. Now, over 70 years later, the very same mentality that led to these heinous acts is once again emerging in the hearts and minds of Europeans. In Paris, thousands of French citizens turned out for a "White March", a silent memorial march in Knoll's honor. Olvey. CC BY-SA 4.0. The study of history allows us to learn the pattern of human behavior and make predictions as to how people may act in a given time and place. History has shown that with the right push, a group can easily become a mob, and even the most “enlightened” cultures can experience rapid cultural backsliding. The current situation in Europe shows how important the teaching and re-teaching of events like the Holocaust are, not necessarily for the purpose of living in the past but rather, trying to prevent such horrific events from occurring again in the future.